Hull Christmas Market showcases most wonderful time of the year. 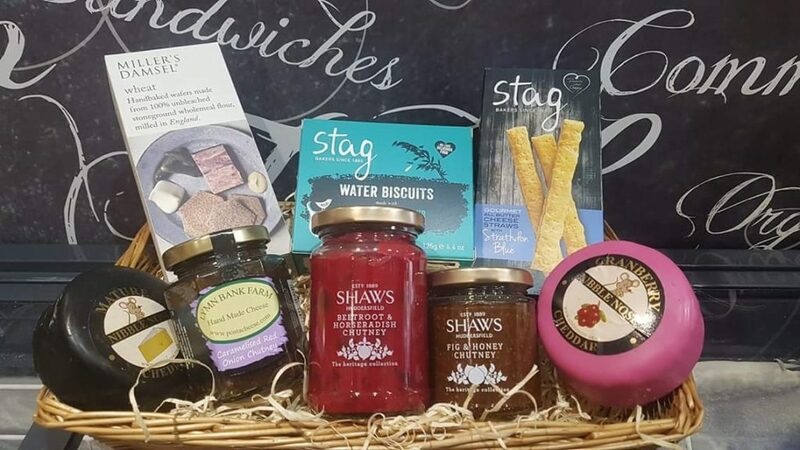 Christmas gifts – hamper from The Store on Pier Street. The Hull Christmas Market is going to get you feeling ready for Christmas as Trinity Square will be alive with festive sights, smells and sounds on 23rd and 24th November, in an event not to be missed. Following on from the highly popular Hull Street Food Nights, HullBID is inviting everyone into the city centre to eat, drink and be merry, with the market happening from midday to 9pm on both Friday and Saturday. Hull Christmas Market will feature around 60 stalls each day, selling a variety of crafts and gifts, plus a strong street food presence to provide plenty of refuelling options for shoppers. Hull Minster and Trinity Indoor Market will be open throughout, and activities will include a brass band, carol singing by the Hull Minster choir, a costumed character show and the chance to have your picture taken inside a giant snow globe. Every street food trader will have something specifically Christmassy on their menu, with food including turkey, stuffing and cranberry pizzas, Christmas dinner Yorkshire pudding wraps, gingerbread waffles and mincemeat and brandy sauce crepes, as well as the traditional bratwurst and mulled wine. Kathryn Shillito, HullBID Executive Director, said: “We have worked hard all year at HullBID organising such events as the Hull Street Food Nights, the Yum! Festival of Food and Drink and Hull Trinity Farmers’ Market and this event is inspired by the success of all of those. “Hull Christmas Market will be a seasonal celebration of quality and quirkiness, with some fantastic gifts for sale including handmade crafts and locally-produced, high-quality food and drink. With the fun continuing well into the evening there will be another taste of the Hull Street Food Nights, which have been so popular during the last two years. “Businesses in the city centre will benefit from the footfall which the Christmas Market will attract and some of them – including Chance Gifts and The Store on Pier Street – will literally set out their stalls to sell their wares. It’s a great opportunity to buy some special and unusual gifts. There will be gifts galore from an array of local traders, as well as homemade advent calendars, festive wreaths and the opportunity to order a real Christmas tree. Hull itself will also be heavily featured for those who want to buy a more personal memento. Anne Fitzpatrick, who relocated Chance Gifts into the city centre last year, said: “The Hull skyline design is really popular and is exclusive to us. It started as a paper cut-out and we now have it on all sorts of other products including Christmas baubles and hip flasks. Glenn Davison has watched the street food sector grow and grow since he launched The Crepe Company and is delighted to have been asked along to the Hull Christmas Market, after trading at the Hull Street Food Nights and Yum! Festival. For more information on this, and other events and special offers in the city centre, visit www.christmasinhull.co.uk and follow Christmas in Hull on Facebook and Twitter. Be the first to comment on "Hull Christmas Market showcases most wonderful time of the year."